The next German Python Conference #PyConDE will take place in Munich at the LMU : looking forward to seeing you there. 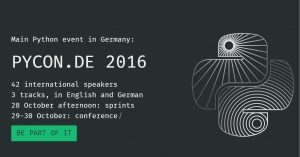 It was held twice in Leipzig, then in Cologne, and in 2014 was joined with EuroPython in Berlin. After one year break, we are back on stage in Munich!